Chandigarh: Days after Aam Aadmi Party (AAP) supremo Arvind Kejriwal announced that AAP will contest all 13 Lok Sabha seats in Punjab on its own, senior AAP leader and Sangrur Member of Parliament (MP) Bhagwant Singh Mann on Wednesday (Jan. 23) said that there was no issue joining hands with any political outfit to oust the erstwhile SAD (Badal)-BJP alliance government or the ruling Congress government under the leadership of Amarinder Singh from the corridor of power. In a written press statement, Bhagwant Mann said that all possibilities of an alliance were being explored so that the alliance could put up a bold united face on the issues and concerns surrounding Punjab and the Punjabis, thereby showing these traditional political parties, knee-deep in corruption muck, were shown the doors. 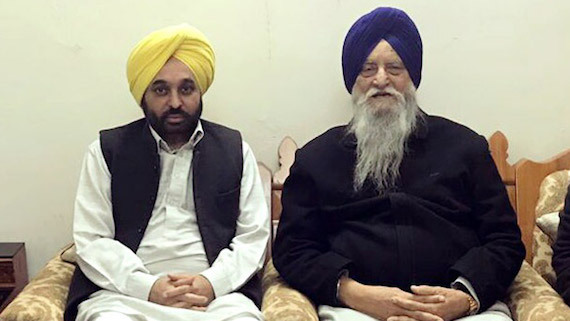 Bhagwant Mann further said that all-out efforts were afoot to possible alliance with the Shiromani Akali Dal (Taksali) and Bahujan Samaji Party (BSP) were underway.